Glittery decorations, blinking lights, presents under the tree – you’ve set the perfect scene for everyone in your family – well except your pup. While you were tucked snug in your bed, your cuddly canine was going to town on your holiday decor. You wake up in the morning to broken decorations, a downed Christmas tree, presents scattered everywhere with wrappers torn to shambles, and your precious pet the cause of it all! While it’s frustrating to see all your efforts going to waste, what’s most important is the health and safety of your canine. The holidays are hectic making it easy to forget pet safety, but that mistake could cost you and your pet. 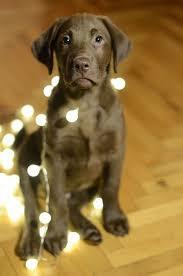 It’s important to consider pet safety when decorating your home, especially during the holidays. The season is a dangerous time for pets. Common pet health emergencies include decorations stuck in the throat, electrocution due to gnawing on decorative light wires, burns from candles or fractured bones from falls. 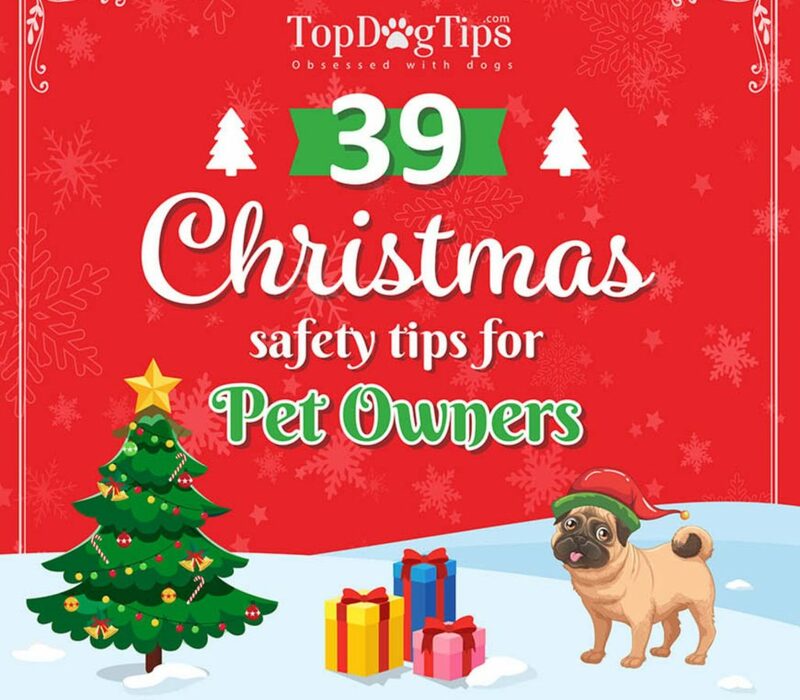 To help you keep your pet safe this season, our friend’s at Top Dog Tips have prepared a pet safety guide for the holidays. Click the image below to access the infographic. Have a safe and merry holiday season. Have you ever wished that you and your dog spoke the same language? While we don’t share the same vocal language, when you really think about it, we can very effectively and successfully read each other and mutually communicate our needs nonverbally, using body language. In fact, most of what your dog has to “say” is communicated through dog body language – her facial expressions, body poses and postures. Some of the key areas of your dog to watch are her head, eyes, mouth/tongue, legs, and tail. For the most part, dog body language is predictive, universal throughout the species, honest and reliable. Sometimes the expressions can be more subtle, but even with an untrained eye, it won’t take you long to learn what your dog is saying. 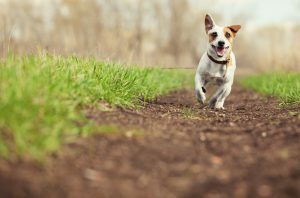 You probably spend a fair amount of time watching and observing your dog already, like when she’s playing and frolicking about, having a grand old time. This is a wonderful thing to do. This gives you insight into what she looks like when she’s relaxed. You might notice things like her ears are in a neutral position, her mouth is open and tongue may be hanging out, her tail is down in a loose position (not rigid or tucked), and her gaze is easy. How about other times? What about your dog meets someone new? Goes to a new place? When she sees something she’s never seen before? Or hears something she’s never heard before? It’s important we observe our dogs during these times as well; dog body language will tell you what they’re thinking. For example, if your dog is on alert but not necessarily behaving in a manner us humans would interpret as fearful or aggressive, you’ll notice numerous signs that she’s assessing the situation. In this case, her ears might be pointing forward, as if trying to pick up a sound, her mouth might be closed, her tail up but not necessarily bristled and maybe even moving side to side, and she may also be leaning forward – all of the things people do when we are trying to make a judgment call about the safety of our surroundings. And there are several telltale (telltail?!) signs that can help clue you in when your dog is alert or aroused, scared or defensive; these may include hackles raised, tail either straight up in the air like a flag (more alert) or tucked under her legs (more concerned), lips curled and perhaps showing teeth, ears either forward or flattened back, and body shifted forward slightly or lowered. Some of these signs indicate defense, whereas others are more friendly. Raised hackles doesn’t necessarily mean the dog is being “aggressive.” On the flip side, a wagging tail doesn’t always mean “happy.” Remember, each dog is unique and different, so the more you get to know your own inquisitive canine, the better you’ll become at reading his or her emotional state – and the message your pet is trying to communicate. 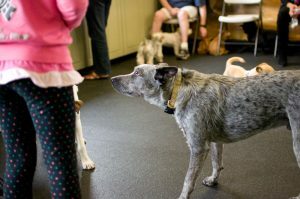 Learning how to sharpen your canine-human communication is easy when you know what to look for. Take a mental snapshot of what your dog looks like (how she acts) when relaxed. This is a great way to establish a baseline of your dog’s friendly behavior. When observing your dog at any given time, look at the entire picture, not just a piece. Be aware of your dog’s surroundings and the possible effects it may have on her behavior. Anything new? Different? Something she might be afraid of? If and when your dog shows any change from that baseline-relaxed appearance, try to determine what the trigger might be, then take note. You may want or need to do some pleasant association training to help your dog relax. The more familiar you are with how she expresses herself, the better able you’ll be able to help her alleviate fear and anxiety and remove her from situations that make her stressed and/or aggressive. 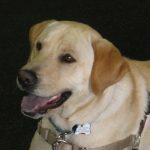 To help you keep track of the various body language your dog displays, and to go further into the world of canine communication, check out the iSpeakDog.org website where you’ll find an assortment of resources to help your communication skills. What does your dog’s body language tell you? Is there something specific he or she does that you know means something special? Let us know what your inquisitive canine is saying! Wanna join the conversation? Just head to the comment section below. Care to share pics and videos of your inquisitive canine? We invite you to post on our Facebook page or follow us on Twitter – Tweet to us and we’ll Tweet ya back! As we start another year, you may be considering New Year’s resolutions for your dog. Read this before making behavioral goals for your furry friend. Hello inquisitive pet parents, and welcome to 2017! I can’t believe we’re starting a brand new year. Time flies when you’re having fun… especially when hanging out with inquisitive canines. When you think New Year, what’s the first word that springs to mind? If you couldn’t help but jump to “resolutions,” you’re not alone. Because who among us – human or canine – doesn’t desire and deserve a fresh start? The key to getting your year off in a pawsitive way is to come at your goals with a dog trainer’s perspective: changes in behavior come from acting in a consistent, rewards-based, loving manner, NOT from sporadic, negative, punishing action. My goal is to motivate, make it fun, and set everyone up for success — humans and dogs alike. So my New Year challenge for you is to shift your attitude towards your dog, and along the way, you might find you can apply some of these strategies in other areas in your life that can use some positive (pawsitive?!) adjustments. even though most of us have our dogs on pedestals and often think they can do no wrong, there’s usually one (or two) things they do that we might find annoying. And then once you hone in on what you’d like to adjust, you have to decide what’s realistic… and what’s not. 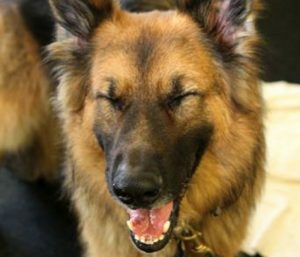 These dog-specific behaviors are common and considered normal for the species, so for most of us, we tend to look the other way when our pets act as expected. But when these behaviors are so pronounced that we find ourselves constantly losing our tempers with our dogs, then it’s time to make a change. Because if we don’t teach them what we want, the annoyance level is likely to escalate, making us more sensitive and shortening the fuse each time they repeat the unwanted actions. The main downside of this cycle is when you are focused on the negative, you get tunnel vision about your dog and forget all of the wonderful things he does the rest of the time. You also may forget that sometimes you actually want, expect, and appreciate some of the specific behaviors (i.e. barking) that you think you want to eliminate completely. 1) Watch what you wish for: This may sound ominous, but it’s actually a literal piece of advice: observe the behaviors you think you want to eliminate in your pet so you can honestly access how you feel about them, and also realistically, what you want to do about them. We need to remember that these “annoying” behaviors are often what we find cute, endearing and funny. And, it’s also these behaviors that make dogs, dogs! Recognizing these factors can help bring us back to reality. Conversely, we may be living with behaviors that aren’t serving our pets or us, and it’s then on us to take decisive steps to improve the situation. Wanted: Sit, down, stay, come when called, leave things alone when asked, go-to-your-place. For all the wanted behaviors, think about where and when you want your dog to perform these behaviors, for example, when sitting at doorways or to greet someone . Now’s the time to re-up your rewards game, and remember to say “thank you” when your animal makes good choices. Barking only once when the doorbell rings, keeping four-on-the-floor when meeting others, using appropriate greeting skills with fellow canines, walking nicely on leash , and eliminating in appropriate places are all worthy of acknowledgment and positive reinforcement. Give her a treat, a loud “GOOD GIRL!” and a snuggle when she is a model canine citizen. As for the less desirable behaviors, let’s figure out if they are truly unwanted and need to end altogether, or if you need to teach your pooch when it’s okay – and when it’s not. For instance, barking. When someone is at the door or too near you personally or on your property, it can be very helpful for your dog to call your attention to the intrusion. My dog Poncho, for example, liked to alert me to “stranger danger,” when I would be loading things into the car and was a bit distracted. In this case, I appreciated his vigilance and would say “Thank you” when he did his job. On the other hand, during the more annoying bark fests, I’d ask him to be quiet, and positively reinforce him for staying silent. If he continued, I asked him to perform a more acceptable behavior, including picking up a toy and holding it in his mouth. Other examples for teaching alternate behaviors to help keep that positive attitude might include: four-on-the-floor instead of jumping, laying on a bed or mat in areas where there are counters loaded with enticing items, and providing appropriate chew items your dog finds motivating. 3) Cop an attitude of gratitude – when you’re pawsitive, your pooch will respond in kind: What it comes down to is catching your dog in the act of doing what you want, make sure you say thank you. Express your gratitude! This alone could be one resolution that you could easily achieve. The other benefit of it is that when you stay consistent with your positive behavior of reinforcing the positive behavior of your pooch, you are engaging in what TIME magazine calls a “prevention goal.” Prevention goals are all about duties and the things that keep you on track versus “promotion goals,” which are the big, lofty, aspirational goals that are easy to dream about but are much harder to achieve. Your refreshed, pawsitive attitude, clarity and consistency around those canine behaviors that enhance, not detract from, your household are resolutions that are much easier to keep, all year long. From all of us here at IC HQ’s, we wish you and your inquisitive canine a happy, healthy, doggone great New Year! The weather outside might be frightful, but that doesn’t mean your inquisitive canine’s holiday entertaining skills — or lack thereof — need to be. Enjoy pet friendly holidays by preparing your pooch in advance. What’s a pet parent to do? In a nutshell: plan ahead, prepare and have dress rehearsals for successful pet friendly holidays. Next, you’ll need to consider how you want your dog to act around company and what outside resources you might need to aid you in getting your desired outcome. For instance, say your dog is an enthusiastic social butterfly and wants to say hello to anyone and everyone, but doesn’t care how he gets the job done: jumping up, licking, barking and, with some especially energetic dogs, the hockey player hip check. As fun and entertaining that can be to some, many might find it annoying. The solution? Ask your dog to greet people nicely. If you’ve done that training with your pet, then you’re already a winner in the holiday entertaining reindeer games. Another option is to use the “Go to your place” cue, where your dog goes to a bed/mat/rug when the doorbell rings or there’s a knock at the door. Guests enter, and the reward for your dog is to say hello after you give the release cue that it is okay to do so. The second part of this behavior scenario is having your dog keep four paws on the floor. They can remain on their “place” while guests come to them, or you can give a release cue where they politely go to your visitors. Remember to reward your dog for behaving politely. A chin scratch, toss of a toy, praise, healthy treat or anything else your pooch finds motivating. For those times when you don’t have time to teach your dog new skills or you’re concerned about the welfare of guests, think about bringing in some help to allow your dog to stay at home while you entertain and/or consider outside resources. Is there’s a friend who’s happy to host your dog at his her home? 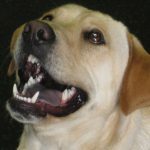 Do you have access to a reputable doggy daycare facility that your pup would enjoy going to? Another option is hiring a certified training, petsitter, or responsible family member to come over and be in charge of your dog while you’re entertaining. We did this for our dog Poncho when we hosted an office party, and it worked out perfectly. He was included, taken care of and enjoyed himself, while my stress level was reduced so I could enjoy the festivities, too. I’ve said it before and I’ll say it again: failing to plan is planning to fail. 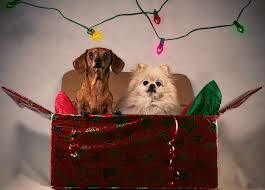 So make your list and check it twice to ensure your plans to entertain holiday guests don’t go to the dogs. Keep in mind that it’s best not to train a behavior or scramble to make other arrangements for your pet the day you’ve got a party planned. Begin training your pup sooner rather than later, and if necessary, locate and lock in necessary resources ahead of time. I can speak firsthand, as can , that the holidays are some of the busiest times of the year for pet sitters, boarding facilities, and trainers. Here’s to a pawsitively pet friendly holiday season to you & yours from all of us at the Inquisitive Canine! Wanna join the conversation? Just head to the comment section below. Care to share pics and videos of your inquisitive canine? We invite you to post on our Facebook page or follow us on Twitter – if you Tweet to us, we’ll Tweet back! Has this ever happened to you? You call your dog by name over and over… to no avail. Then you open a can of food and voilà! Out of nowhere, you hear the pitter-patter of paws heading toward you at top speed. As a certified trainer and also a dog mom, I feel very strongly that when it’s “recall” time, ALL dogs (yes, ALL dogs) need to be taught how to respond. There is a right way to teach your dog recall. It’s not just about manners – there are definitely times when getting your dog to come to you is for his safety. And it’s best to teach your dog before you need the behavior – not during. You wouldn’t teach someone a fire drill during a fire, right? To teach your dog to come when you call, start by backing away from your dog using your happy voice, clapping and praising as he approaches you. Stop, ask your dog to sit (optional), reach in and grab his collar with one hand, and give him a tasty treat from the other. Repeat this several times, until your dog is almost chasing you around and not allowing you to start over again. Now try this at the same distance in a different location, still with few distractions. Repeat the first step, but from 8-10 feet away, even if your dog is doing something else. Reward with the process outlined in the first point (happy voice, clapping/praise, etc.) If your dog doesn’t come to you right away, go to him, lure him back to where you called to him from, then reward using the above steps. Once your dog has become skilled in these steps, repeat the same exercise in different rooms of the house, especially when he isn’t expecting it, and reward in the same manner. This way, he continues to associate coming to you with wonderful things! After he has mastered this, you can move outside. Practice the routine as described above in the same way in a fenced yard or secure outdoor area, keeping your dog on leash for safety reasons if necessary. Begin just a few feet away, progressing to a farther but safe distance. 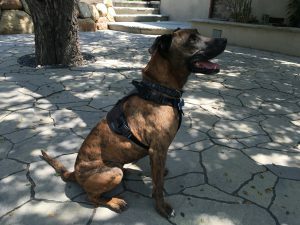 Practice the backing-away recall while out walking your dog on leash. Give the cue when your dog is facing forward, not looking up at you. If you want, you can get a longer leash (long-line*) and practice the same exercises from a farther distance. *For safety reasons only. Be cautious not to get your dog tangled up in the leash. Do not use this leash for pulling or dragging your dog away from something. Only call your dog for something pleasant. Only call your dog if you know he’s going to listen and follow though with your request. If you misjudged on rule two, save the recall by going and getting your dog yourself, and bringing him back to where you called from, then reward. Use the cue word once and only once, but be a cheerleader, using additional methods of communication to help get the message across: body language, whistling, clapping, happy talk. Is your inquisitive canine already for an advanced level of recall? Try practicing the Round-Robin exercise: Send your dog back and forth between two or more people in a room or outdoors (in a safe environment). Each person takes a turn calling the dog, performing the reach-for-collar/treat-with-other-hand game. If at any time your dog chooses not to come, the person who called him/her should go over, lure him/her to where they called from, then reward. Once you’ve achieved total recall with your inquisitive canine, you’ll be the star of the dog park with the most obedient pup around. Now if he could just learn how to change the oil and perhaps run a vacuum cleaner every once in a while…! The holidays are coming, and one of the best parts of this time of year is having friends and family over to celebrate together. For inquisitive canine parents with dogs that don’t know how to politely greet people, though, having people over often only adds to the stresses of the season. 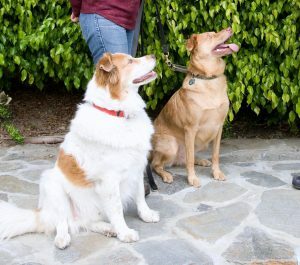 As a certified trainer, dog lover, and member of the therapy dog organization Love on a Leash, I find a composed dog greeting, be it at home or along the way, of the utmost importance – everyone appreciates a polite pooch. So let’s get started with strategies for better dog greeting! 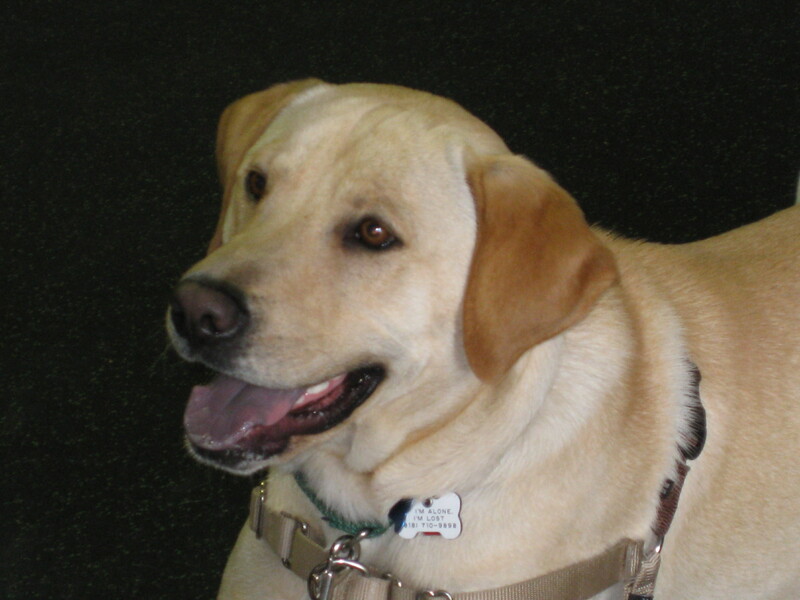 The goal for Part 1 of this behavior training is to teach your dog better dog greating. They need to learn that sitting or standing to greet you and other family members is much more rewarding than jumping up. First, reward your dog with petting, praise, treats or the toss of a toy whenever s/he greets you with “four on the floor” (all four paws on the floor) or sitting up nicely. Approach your dog, or call him or her toward you, and ask for a sit. Once s/he sits, reward her or him with positive attention. If and when your dog jumps up on you, turn away and ignore. As soon as your dog stops jumping, and his or her paws are back on the ground, turn around to face him or her and reward. When s/he doesn’t jump, pet and praise your dog. If you have treats, give one. If s/he gets too excited and jumps up again, turn your back again and start over. If you turn your back but your dog keeps jumping on your back, try walking away. It’s important that you completely ignore the dog — don’t talk or chide. Pretend like s/he is not there. The goal for Part 2 is to teach polite dog greeting for other people, including friends and strangers. Warm up your dog by having her or him sit for you when s/he wants to say “hi” and be petted. Have family members and friends do the same. Then take it on the road. When a stranger approaches your dog (or when you approach a stranger with your dog, after having ascertained that person wishes to be approached), ask your dog to sit. Your dog must stay in the sit position as the stranger approaches to pet her or him. Give a treat to your dog for sitting as the person approaches. If your dog gets up, stop the treats and ask the person to stop or take a step backwards. Your dog will soon learn that if s/he stays seated (or next to you with four on the floor), then s/he receives attention from you and from the person saying hello. Conversely, if s/he gets up, s/he gets nothing. Your inquisitive canine will soon figure out which is the better choice. Keep in mind that walking away from the person, or not allowing the person or other dog to say hello is not intended as a punishment, so refrain from jerking the collar or using an angry voice. The intention is simply to keep your dog from jumping up (before s/he can scare someone or dirty that person’s clothes), and to communicate that s/he lost the opportunity to greet the person. Throughout these exercises, you can turn to explain to the stranger that you’re teaching your dog not to jump. If the person seems interested in the training process or your dog, you can ask that person if he or she wouldn’t mind helping. If so, repeat the above procedure until your dog doesn’t try to jump. At that point, allow the person to pet your dog and say hello. Now is the perfect time to practice jump control training so that by the time the holidays are here, your rover will be perfectly polite when people come over! Wanna join the conversation? Just head to the comment section below. Care to share pics and videos of your inquisitive canine? We invite you to post on our Inquisitive Canine Facebook page. Hey there inquisitive dog lover! 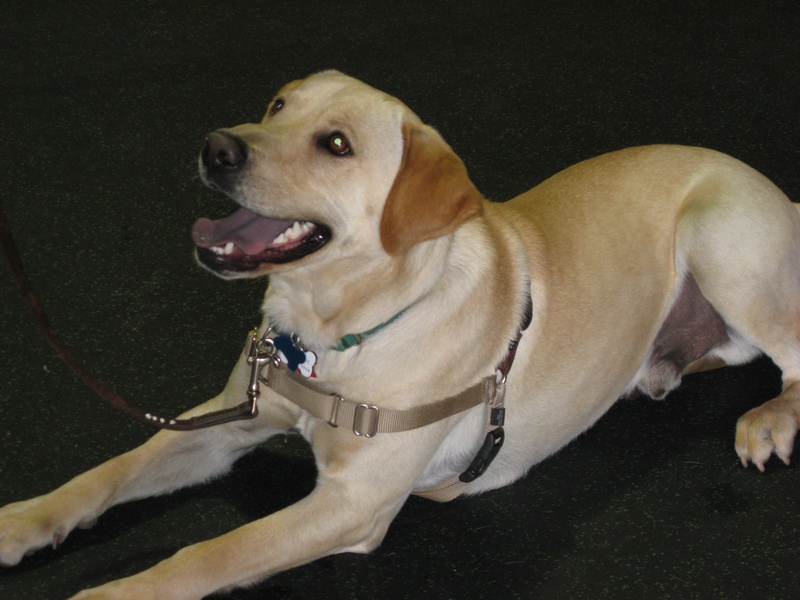 Welcome to session 2 of our Back to School for Dogs Too basic dog training series. If you’re just joining us, check out session 1 for tips and lessons on getting started. If you’re continuing on, we say “Yay!” click-treat, and thank you for participating. For this specific installment of basic dog training techniques, we will be focusing on “Sit” and “Down.” As a certified trainer, I have come to lump these, along with eye-contact, as the main trifecta of dog behaviors. If your inquisitive canine can master these, then you will not only set yourselves up for success, but will also create a solid foundation for many other behaviors and situations. Here are basic dog training techniques you can learn from home. Here we go! Wait for your dog to sit. As soon as his or her rump hits the floor/ground, “click and treat” (C/T) or use your marker word, as explained and outlined in Session 1 of our Back-to-School program. Once your dog starts sitting reliably every time, you can add in the cue word “sit.” Practice doing this 5-10 times: saying the word “sit,” pause to see if he or she does, if not use the food lure then C/T. Repeat this until you no longer need the food lure. Begin with a treat in one hand, placing it on the tip of your dog‘s nose, slowly move it downward towards the ground, guiding him or her into a “down” position. As soon as your dog lies down C/T. 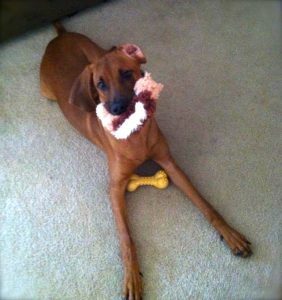 Repeat this “lure and reward” technique until your dog does the motion reliably, without pausing. When he or she does the motion reliably, you can begin to add the cue word “down,” before luring. Say the word “down,” pause to see if your dog lies down, if he or she does then C/T, if not, then use the lure-reward technique to move him or her into the position, then C/T. 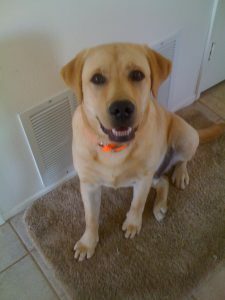 As your dog begins offering the behavior reliably, you can begin to fade out the food lure, using only your hand signal as a prompt. Still C/T after your dog lies down, and reward! Repeat this sequence until your dog is following reliably, then begin to fade out the food lure, using only your hand signal. If your dog is having trouble lying down, try starting him or her from the sitting position. An alternative is to C/T for smaller, baby-steps towards the final down position – head focused downward, elbows bent, chest on ground, etc. Remember to use the cue only once! Wanna advance your skills? Use only the verbal or visual cue in different locations with different distractions. To “test” if your dog understands, ask a stranger to give the cue! For a fun way to practice both “Sit” & “Down” at the same time, try”Puppy Push-Ups”! Remember to check back for upcoming Back to School and basic dog training posts (or subscribe to our blog), to keep up with behavior momentum and fluency! Wanna join the conversation? Just head to the comment section below. Care to share pics and videos of your inquisitive canine? We invite you to post on our Facebook page. Paw-triotic pooches Cooper & MacKenzie enjoying play, while being kept safe by mom and dad! Happy July and here’s to wonderful Fourth of July! It’s a fun and festive time for our country and local communities. While humans are reveling in picnic games, barbecue menus, and colorful theatrics in the sky, the holiday can be a totally un-celebratory experience for our inquisitive canine family and friends. As a certified professional dog trainer, I know how terrifying a thunderous fireworks display can be for pets or how a quick sniff of meat in hot coals can turn into a painful burn on a cold nose. With some preparation and environmental management, the Fourth of July can be a star spangled holiday for all family members. 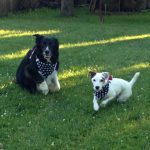 Here are a couple of previous patriotic posts that readers have found helpful in making the day a special one for their inquisitive canines. 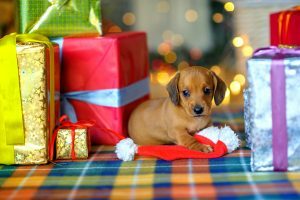 This Doggie Blog post offers a variety of gentle reminders and suggestions to create a stress free holiday for all involved. I offer some management and training tips to help make the Fourth an enjoyable day on this Noozhawk post. This post on Edhat, Pooch Patriotism Means Celebrate Smart, is written from the canine point of view. For those of you who prefer an infographic, check this out on petfinder.com. Here’s to wishing all of us a safe and enjoyable holiday. Let freedom ring – bark, or howl! Wanna join the conversation? Just head to the comment section below. 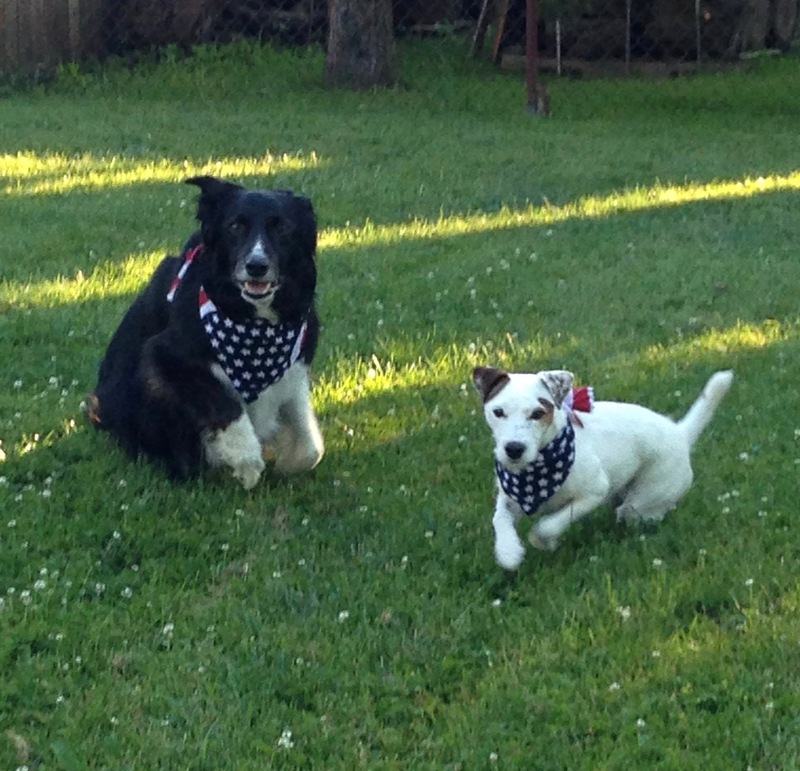 Care to share patriotic pics and videos of your inquisitive canine? We invite you to post on our Facebook page. Nail biting, hair twirling, and pacing are examples of nervous behavior in humans. In the world of canines, behaviors dogs use to cope, relieve stress, or stave off trouble (rather than deal with it directly) is called displacement behavior. Called so because the behavior is out of place, or displaced. The behaviors themselves are normal but happen out of context – such as a dog shaking off as wet when dry. 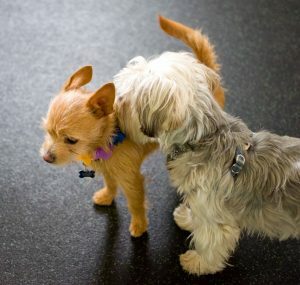 As a certified professional dog trainer and behavior consultant, I know how subtle these behaviors can be, and I can’t emphasize enough the importance of trying to understand what your dog’s body language is communicating. That’s why regular interaction between dog and human is so crucial, so you can tell if a behavior is out of context. When you notice something’s out of the norm, you may be able to prevent unwanted behavior between your dog and other beings. I’ve seen my fair share of displacement behaviors, which happen because of frustration or conflicting impulses to behave in a manner that is impeded. The displacement behavior also manifests when a dog has conflicting emotions and does not know what to do. Here’s an example: a dog is “caught” sleeping on the couch when its humans come home. She’s happy to see them but fears being punished so she “looks guilty” and kind of slinks to greet them. Please note that displacement behavior is a personal issue the dog is having. It’s about an individual dog and not about canine social hierarchy, pack mentality, or deference. Displacement behavior often serves as a warning – “Careful, I’m feeling real uncomfortable right now and I just might start lunging.” Should you notice your inquisitive canine exhibiting displacement behavior, change the environment to make your dog feel safe and comfortable. Woofs and wags to Companion Animal Psychology and its #Train4Rewards Blog Party. You think I’d miss this party? Read on! A woman asked Poncho why her inquisitive canine, a 13-year-old lab, would sometimes discreetly pee in her parents house, though the girl dog never had an “accident” at home. Poncho breaks down his answer into four points. Know Your Animal – Dogs eliminate when they feel the need, unless they have been taught otherwise. 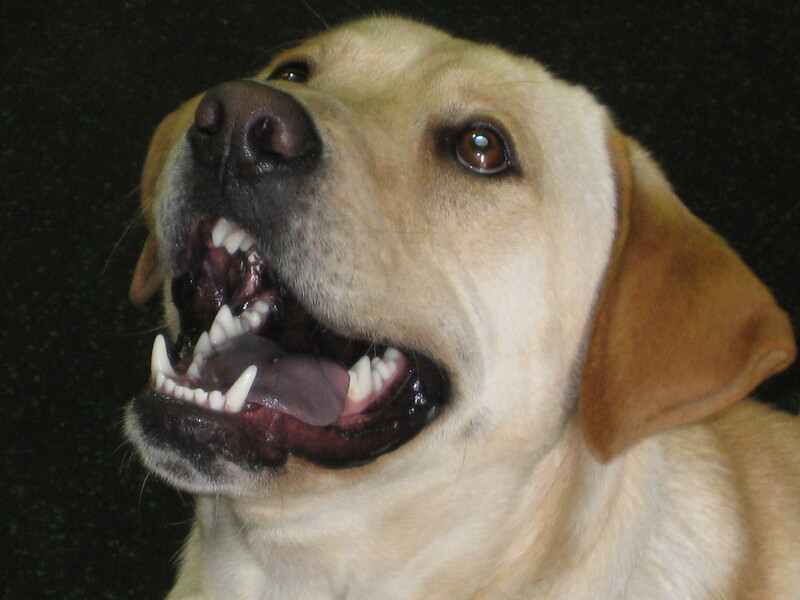 A couple of triggers dogs commonly react to are: texture and scent. For texture, think dirt, grass, tile, cement, and carpet. Oh, about wet grass … do you like a wet toilet seat? For scent, a dog’s world is one big perfume counter. Observing another dog going potty, updating status by “marking” territory, and previous learning are a few triggers that give dogs the urge. Additionally, dogs understand “safe and dangerous” as opposed to “right and wrong.” Maybe the lab had a previous accident and got into trouble, so the lesson she learned was to “go” when no one was around. Please note: 13 years is on the senior side of a canine’s life, so a visit to the vet may be in order to rule out any medical issues. Communicate Clearly – Humans need to determine what they want from their dogs. Go potty in a specific spot? Or just not indoors? Take the time to teach the wanted behavior and manage environments to help your inquisitive canine to make better choices. Reward, Reward, Reward – It’s all about the reward. In the lab’s case, upon arrival at the parents’ house, the human should put the lab on a leash, take her to where she should go potty and wait. And wait and wait. If necessary, wait some more until potty victory. Then, celebrate! Give her a big whoo-hoo! Some chin chucks and scratching followed by an edible treat … and the big reward: being allowed inside. Once inside, be sure to keep an eye on her so she can be brought outside immediately should you observe signs she is likely to go. Should her motivation be marking her territory, then follow basic house-training: keep an eagle eye on her and reward, reward, reward for eliminating outside, along with ignoring areas she likes to claim as her own. Take her to places she’s allowed to mark to provide an outlet to fulfill her doggy needs and wishes, while having fun and bonding together. Set the Stage for Success – Extra time is needed when bringing the lab to her “grandparents,” who need to be in on the game plan. (They may need a little training themselves.) If the grandparents are distracted easily, they may want to keep their grand-dog on a leash or in a roomy, comfy crate. If allowed to wander at will, something may trigger the lab’s urge to go. Setting her up for success, not failure is key. 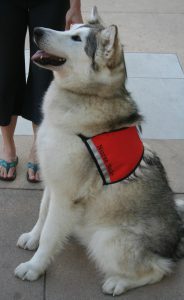 Paws and reflect – It’s best to use house-training basics: teach, reward-reward-reward, and manage the situation. Inquisitive canines don’t know the right thing to do by instinct no more than humans do. For example, if someone were to visit your house, you would show them where the bathroom is. If you didn’t they may choose a bathroom on their own and it may not be the one you’d like guests to use. You’d have no one to blame but yourself if they went in the wrong place.